Its major export partners are Switzerland, China, the United States, and the Netherlands. Its main exports are coffee, oilseeds, and edible vegetables. Its major import partners are China, the United States, and Saudi Arabia. Its major imports include machinery and aircraft, metal, and electrical materials. Located in Eastern Africa, Ethiopia has a 5,925.00 km border with Djibouti (342 km), Eritrea (1,033 km), Kenya (867 km), Somalia (1,640 km), South Sudan (1,299 km) and Sudan (744 km). Eritrea and Ethiopia agreed to abide by the 2002 Eritrea-Ethiopia Boundary Commission's delimitation decision. Currently, the capital of Ethiopia is Addis Ababa. It became a capital city in 1887 taking the title from Entoto. The town is located on a plateau with hills and mountains surrounding it. The urban population of Addis Ababa is about 3.38 million, while the metropolitan population is approximately 4.58 million. Being an administrative, cultural, and financial center, Addis Ababa is also a great tourist destination. Some of the famous destinations include the Ethnological Museum, the Lion of Judah Monument, the Yekatit 12 Monument, and the St. George Cathedral and Museum. The climate of the city is classified as sub-tropical highland. Ethiopia is an African country covering 1,104,300.00 km2 of which 9.44% is water and 1,000,000.00 km2 is land. This makes it the 26th largest country in the world and slightly less than twice the size of Texas. Its geographic coordinates are 8 00 N, 38 00 E and Addis Ababa is the capital city. 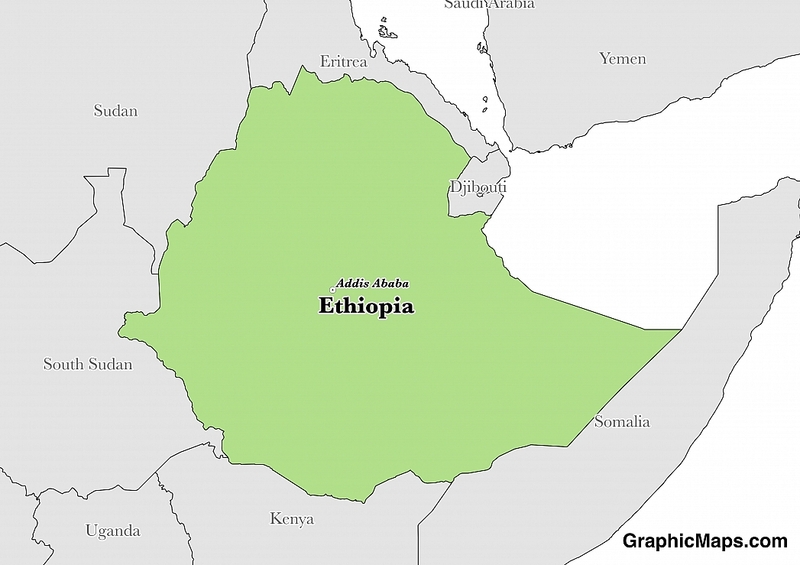 The country's name derives from the Greek word "Aethiopia". Its ISO code is ET. Ethiopia has a mean elevation of 1,330 m above sea level. It has a tropical monsoon climate that varies with elevation. Its terrain consists of high plateaus with a central mountain range divided by the Great Rift Valley. Ethiopia has a population of 102,374,044 making it the 13th largest in the world. Oromo, Amharic, Somali, Tigrigna, and Afar are all official languages. The major ethnic group is Oromo, followed by Somali and Tigray. The majority of the population is Ethiopian Orthodox or Muslim. Ethiopians speak about 88 languages. Out of these, the main languages spoken are Amharic and Oromo. For official purposes, the language used is Amharic. It is the language for instruction in schools, the business language, and the language used in government meetings. Besides Amharic and Oromo, the other languages include Sidamo, Wolaytta, and Gurage. The minority languages are Ongota, Gafat, Weyto, and Mesmes. The dialing code for the country is 251. Ethiopia is an independent country. Ethiopia is one of the oldest countries in the world; at least 2,000 years old. Its constitution was last ratified in 1995. The government of Ethiopia is a Federal parliamentary republic. It is led by a President, Prime Minister and their assistants. The president is the head of state while the prime minister heads the government. Both the President and Prime Minister serve for six-year terms. The official residence of the President is the National Palace which is found in Addis Ababa. The Prime Minister does not have an official residence. Factoring in Purchasing Power Parity, Ethiopia's GDP is $175,000,000,000.00 (USD) with $1,900.00 (USD) per capita. This makes it the 68th largest economy and its citizens the 198th richest in the world. The currency of Ethiopia is the Birr (ETB). Its major export partners are Switzerland, China, the United States, and the Netherlands. Its main exports are coffee, oilseeds, and edible vegetables. Its major import partners are China, the United States, and Saudi Arabia. Its major imports include machinery and aircraft, metal, and electrical materials. The flag of Ethiopia features three colors: green, yellow, and red. The flag is divided into three horizontal portions. The green color symbolizes the agricultural aspects of the country. Red denotes strength while yellow represents hope and peace. The blue painted inside the circle is a symbol of peace. The designer of the Ethiopian flag was Abebe Alambo. After its designation, the government adopted the flag in 1996. The flag acts as both a national ensign and flag.